Over the last several weeks, I have been working with computer users at work as we start to change over to a new network system and upgrade some of our software. I was surprised that many of them did not know how to choose a browser and set it as a default. The three browsers of choice are Chrome, Edge, and Firefox. I know that most browsers prompt you to set them as your default browser (unless the setting is turned off). Here’s the Firefox callout. If your browser doesn’t notify you, you can open up settings or preferences in the browser to find the option to set it as your default. In Firefox, click the menu button at the upper right of the browser window (the three horizontal lines), and then choose the “Options” command. You’ll see the default browser setting right at the top of the page, as below. For the Chrome browser, hit the menu button in the top right (the three vertical dots), and then choose the “Settings” command. Scroll down a bit, and you’ll see the “Default Browser” section. 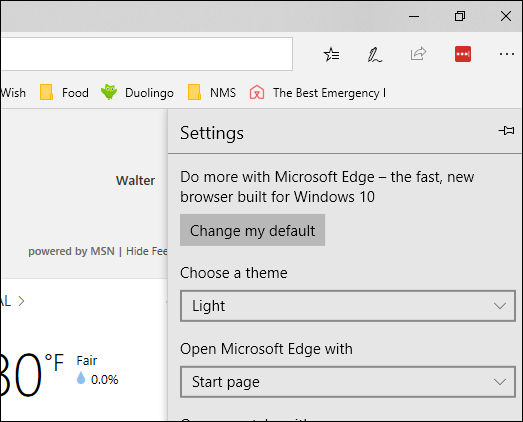 Edge is a Microsoft product. So you need to hit the menu button at the top right (the three horizontal dots), and then choose the “Settings” command. Right at the top, click the “Change My Default” button. And, there you have it! Three browsers that are each able to be set up as the default browser. Remember that Default means that it is the first browser of choice. You can still choose a different browser on your computer to look up information, if you think one browser is faster than another.